Ahoy, Matey! 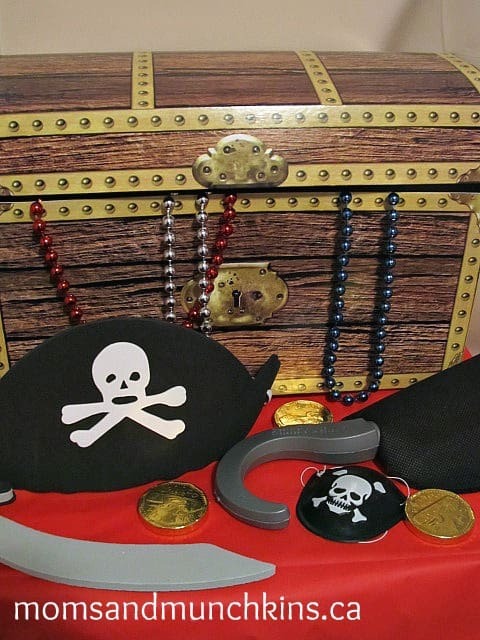 One of the coolest birthday parties you can plan for your little ones is a Pirate Party! 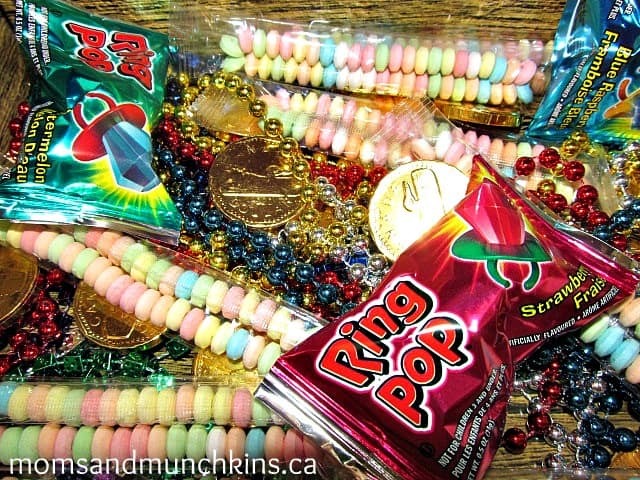 Here you’ll find ideas for invitations, decorations, activities, food and treat bags. 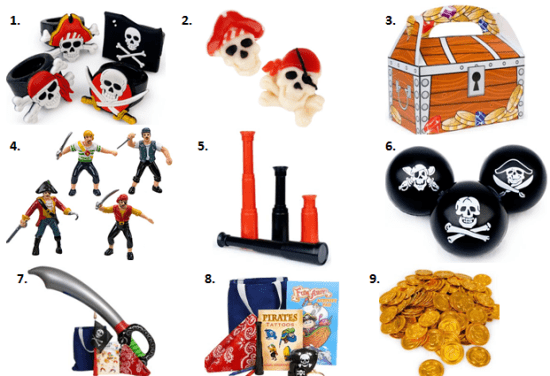 What would a pirate party be without a treasure hunt?! Once the guests have arrived to the party, let them know that a scallywag has stolen the pirate’s treasure and it’s up to them to track it down. Create challenges that the children have to complete in order to receive their next clue. The last clue will be a treasure map (see the fun treasure map paper below) to the hidden treasure. You can hide this in the backyard with a map of the layout of your backyard with an “X” marking the spot that the treasure has been hidden. Pinata: Once the children successfully break the pinata, they’ll find their next clue in with the pinata’s candy filling. Sea Legs: It’s important for pirate’s to develop strong sea legs to survive the rough seas! Using a baseball bat, have children place one end of the baseball bat on the ground and bend down to put their forehead on the top of the baseball bat. Have each child spin 5-10 times and then try to run straight and across the finish line. There will be a lot of sideways running so make sure there isn’t anything for the children to hurt themselves on. Pirate Code of Conduct: All pirates must adhere to a strict code of conduct. Write this code of conduct onto a large poster, let the children view it for 30 seconds, then turn it back around and have the children shout out the codes of conduct. Once they remember them all, they can receive their next clue. Codes of conduct can include items such as: Must always refer to their pirate crew as “Mateys”; Instead of “Yes” must say “Aye Aye!”; Once the treasure is found, all pirates must shout “Shiver Me Timbers!”; No pirate shall ever let another pirate walk the plank alone…use your creativity to come up with some more fun codes of conduct. Canon Ball Practice: Using a few toy shooters and foam balls, have the children participate in canon ball practice. Leave a few empty bottles out on a table, have the children stand at the designated line and try to knock down the bottles with their canon. Try printing your own fun food place cards using this free template and some pirate stickers. Have Fun & Happy Planning Mateys! We love parties and we’re always adding new fun ideas. Never miss an update by following along on Facebook, Twitter, Pinterest and Bloglovin’. *Disclosure: I am part of the Birthday in a Box, Big Dot of Happiness, Tiny Prints, Inc. and Amazon.com affiliate programs. My son would love a pirate party! I’m gonna have to remember all of these great ideas. You’ve got a great assortment of pirate invitations. 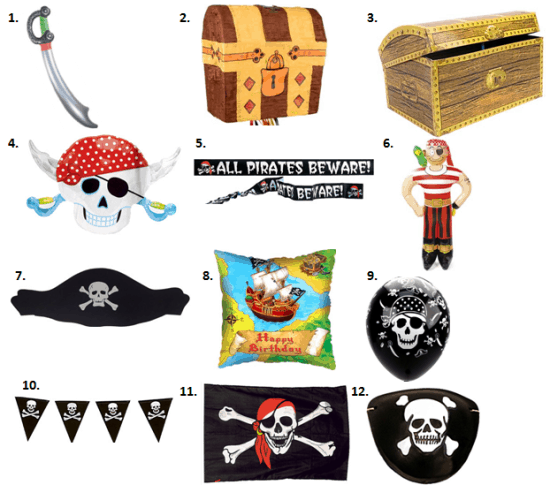 Pirate parties are so much fun and easy to put together. Love you article.